From the time I was young, I always loved quilts. I can always remember sleeping under them at my Grandmothers house. I even remember Grandma and my Aunt Ina working on quilts together, they really enjoyed it. My other grandmother as she got older went legally blind, but still she would ask us to pick up material for her and then a blanket for the backs. She would cut ( with scissors only ) and Hand Stitch each one. Then she would add on the back and some decorative stitch on the front. These quilts gave her something to do on those long days and nights when she couldn't do anything else. She couldn't read, watching the TV was getting harder and she couldn't garden any more ( one of her big loves ) and so she quilted. There is something healing in the art of quilting, both for the quilter and those who it was made for. Quilts are also very comforting and safe to be under! That is why I keep quilting! How grateful I am to teach at the Quilt Shop! THIS QUILT WAS DESIGNED FOR OUR FIRST GRANDSON! THIS ONE WAS DESIGNED FOR A DEAR FRIEND! 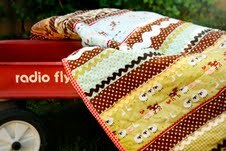 THIS QUILT WAS DESIGNED FOR A SAMPLE IN THE QUILT SHOP, BUT LAUREN HAS TAGGED THIS ONE! THIS QUILT IS ANOTHER ONE I DESIGNED FOR THE QUILT SHOP LAST YEAR, IT'S 3-D! Friendships are made one stitch at a time. Friendships enfold and then conform. So each person can be what she must be. That friendships are made one stitch at a time! I just finished painting two mini (2'x2) barn quilts. Those are fun to make! Nothing says love like a quilt.